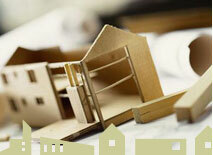 Insulation is now required in most homes being built. 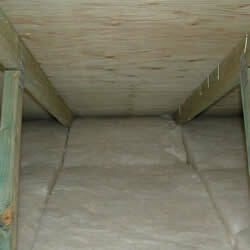 Attics are required to have proper ventilation to keep attic temperatures close to the home's in efforts to reduce the cost and amount of electricity used when trying to cool homes. When this attic was inspected it had fiberglass insulation laid above the ceiling and between ceiling joists, however the insulation improperly covered the soffit vents. This blocks the flow of air and results in heating the attic. The temperature was 107° at 6:30 in the evening. It is recommended to cut back insulation and install a solar vent to extract hot air through top of roof. When doing an exterior walk around this house, it was noted that there were no bathroom vents exiting from the roof. 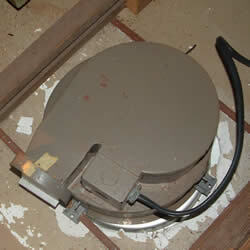 In the bathroom the extraction fan was found to have week suction, yet it seemed to be new. This information was noted. During the attic inspection it was discovered that the fan was extracting the hot, moist air from the bathroom improperly into the attic . The vent couldn't remove the air from the bathroom correctly because there was no exterior escape. In addition this attic had no vents at all, causing negative air pressure. Air had to exit the attic through cracks outside and into other rooms of the house .